Today’s image is one of my personal favorites from Veritas this year. I wanted to show this photograph because I remember very specifically the moment this shot came together. I was moving between two rooms in the upstairs section of the building, photographing the details, the dress……anything that showcased the moments leading up to the ceremony. My favorite details of the day are a result of looking at the big picture. 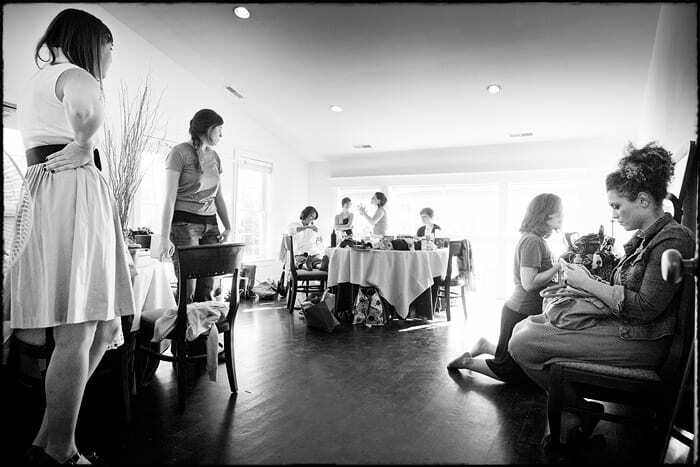 To me, this image is the big picture – everything all in one – the afternoon preperatory period for the bridesmaids. I knew this shot would work wonderfully the moment I clicked the shutter. I quickly saw everything in front of me layered perfectly, and wanted it all in one image. Very quietly, I dropped down to one knee – just outside of the doorway. If you look carefully, everyone is doing something unique and the image layers itself nicely. One lady is texting, one is looking in the mirror, two are in coversation, two are in the background at the table, and two are watching from the left, framing the scene nicely. I love the challenge of capturing all types of images at a wedding, but I have to say, it is images like this that I strive for……..layer after layer after layer and nothing I would consider a distraction.